There are a lot of reasons you might bake a dessert for someone -- a birthday, accomplishment or thank you -- but this may literally "take the cake." Florida deputy Michael Wohlers tased Stephanie Byron in 2015. Wohlers allegedly tased Byron after arguing about sweet tea and acting aggressive towards her. 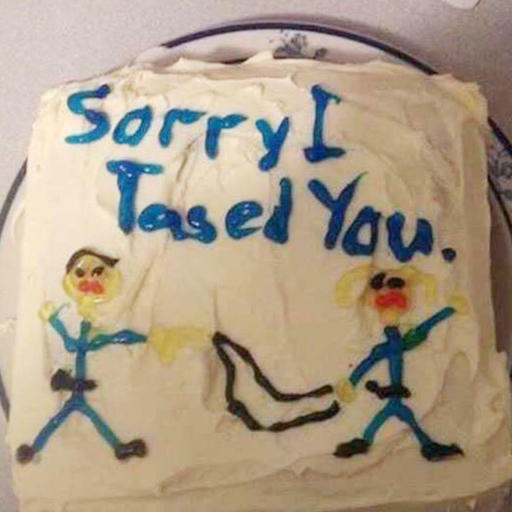 The cake was not enough of an apology for Byron. She filed a lawsuit against Wohlers for reasons such as violating civil rights and causing physical and mental hardship. Wohlers' attorney denied the allegations, but Byron's attorney used the cake as an exhibit in the court file. On Monday, Wohlers was sentenced to one year probation from any Florida law enforcement agency. The lawsuit is currently pending.